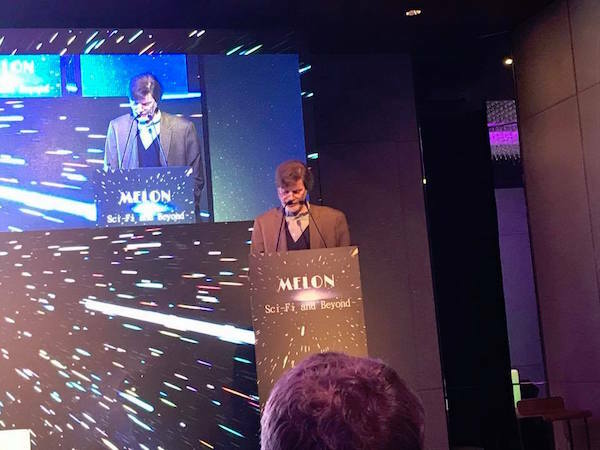 On March 17th, 2018, Melon Conference 2 was held in Hong Kong. 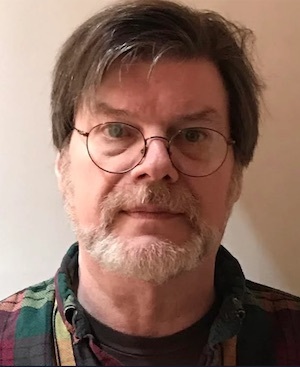 In this interview, the author and keynote speaker at the conference, Allen Steele, shares his thoughts on the current state of SFF in Hong Kong and China today. YUNCHTIME: Greetings, Allen! Welcome back from Hong Kong and China. Was this your first trip to Hong Kong? STEELE: It was my first trip to Hong Kong, and also my first trip to Asia. My wife had been to this side of the world before, when she visited Nepal and Thailand in the 90’s, but until now the farthest I’ve gone from home has been France and Germany. So it was an eye-opening experience to visit first Hong Kong, which is a futuristic global city where all kinds of cultures are present and, so far as I can tell, part of an emerging Asia-centric melting pot — similar to what America has been prior to our country’s recent turn toward xenophobia — and then Beijing, which is a sprawling megapolis at the heart of a strange cross between rampant capitalism and authoritarian socialism. In both places, I found much to be astounded about every day I was there. YUNCHTIME: Did you know the Melon Conference organizer, Fritz Demopoulos, previously? How did you end up participating as the opening speaker of Melon Conference 2? STEELE: I hadn’t any previous contact with Fritz until he reached out to me last year with an invitation to come to the first Melon conference (he’s resisting the impulse to call it a con, by the way, which I support; the “con” appendix has become overused and abused). As I understand, I got on his radar when he read the Wall Street Journal review of my novel Arkwright and read the book, and then Coyote after that. But I was about to undergo a major pancreatic operation when I received the first invitation, and my doctors told me that I’d be in no shape to travel for several months afterwards, so I had to turn it down. I thought that was the end of it and that I’d kissed off a chance to visit China, but early last January Fritz surprised me by repeating the invitation, this time for Melon 2018. My doctors approved me for long-distance travel, with the usual cautions about diet, rest, and not neglecting my meds, and so I was able to attend. When Fritz told me that I could have time for a solo presentation or an interview, I decided to go with the first, since a lot of people there might not be familiar with my work. Since I’ve been studying SF’s early history lately, I decided to make that the topic of my speech. After I told him what I meant to do, Fritz decided that this was a good topic for a keynote address, after his own keynote introduction. So it was a considerable surprise to be accorded the honor of presenting the opening session, and I tried to make the best of it. .
YUNCHTIME: So glad to know that you recovered and could go to Asia this year! How about your presentation “The History of Science Fiction, and Why it Matters” is that available online for us to read?. STEELE: It will be reprinted as a guest editorial in an upcoming issue of Asimov’s Science Fiction. Sheila Williams has just bought it for the magazine. I imagine that Asimov’s will make it available on their web site when the issue comes out. YUNCHTIME: What is your impression of Fritz Demopoulos? Is he a big SFF fan? Demopoulos is a successful entrepreneur and venture capitalist, do you think he sees a business opportunity for the SFF genre in Hong Kong and China? Beginning with my keynote speech, each of us got up and did 20-minute presentations or participated in on-stage interviews or panel discussions. Coffee breaks every couple of hours and a mid-day lunch gave us a chance to mingle and carry on discussions based on what had been talked about onstage. So this wasn’t like the usual American SF convention, but neither was it like the ICFA or the Campbell conference. It’s very different from what’s being done here. and I’d give a lot to see something like it attempted in the states. YUNCHTIME: Typically Hong Kong has been a super exciting place for business, travel, food, and cinema. How do you think SFF fits into HK culture? 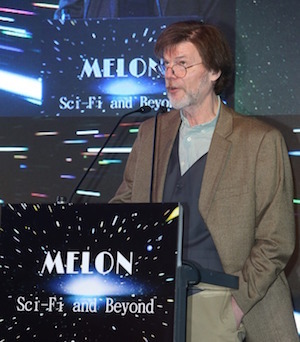 STEELE: There was a lot of discussion at Melon about science fiction’s growing popularity in Hong Kong and China — there doesn’t seem to be as much interest in fantasy aside from Chinese medieval-fantasy movies and the Game of Thrones franchise — and how it’s poised to become the Next Big Thing in Chinese mass culture. And there’s a reason for this: that part of the world has become the leader in scientific and technological development, and is rapidly outpacing the U.S. It’s much like what happened in the US and Britain when SF’s Golden Age occured during World War II and the post-war sci-tech boom. Now it’s happening over there, and I saw evidence of this just about everywhere I looked: issues of Science Fiction World being sold at just about every Chinese-language newsstand I inspected in Hong Kong and Beijing; Star Wars and Marvel superhero movies on Chinese TV every night; big SF sections in both the Chinese and English-language bookstores I visited in Beijing — I found the Mandarin edition of Coyote in what seemed to be Beijing’s largest bookstore, which made me very happy - and enormous banner-ads for Pacific Rim Uprising in bus stops and subway stations all over both cities. So China is ready for SF, and since there are a lot of people there trying to make money from it, that’s going to be the next major market, even as genre SF slowly fades here in America. YUNCHTIME: Were there any lively discussions or disagreements at Melon Conference 2? STEELE: Well, again … just as Melon 2018 wasn’t a con in the way the American SF community is used to seeing, so the way things were discussed was different. In those 20-minute presentations, there wasn’t enough time for audience participation, so that sort of interaction was missing for better or worse … and having been a panel moderator more times than I can count, I’d say it was both. On the other hand, if you wanted to discuss something with a panelist, there was a perfect opportunity to do so during the coffee breaks. Which was a difference I enjoyed very much. Instead of having to field questions shouted from the back of the room, this time I got them from someone standing right in front of me, in a calm tone of voice, while both of us having coffee and maybe a light snack. Disagreements? Nope … just a lot of polite, stimulating conversation. Nice change from the way most American cons are these days. Cons here are becoming increasingly confrontational and unpleasant; there (in Hong Kong), it was the ideas that mattered, not the politics or gender identity of the persons expressing them. 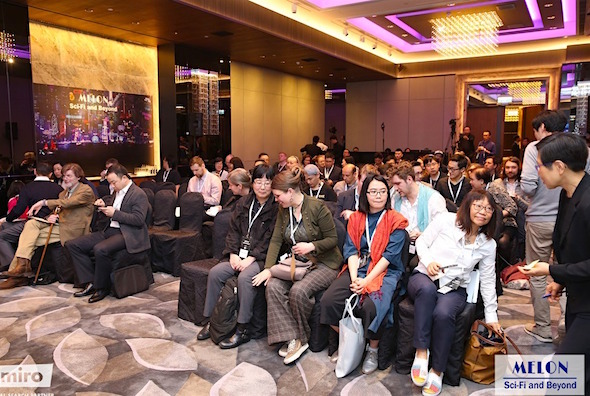 YUNCHTIME: Are the HK Melon Conference audience familiar with US and European SFF? STEELE: It seemed to me that they were. At least most of them seemed to be familiar with my work. YUNCHTIME: How about the writers, are they responding to the context of our US / Euro SFF? Or primarily coming at the genre with their own perspectives? STEELE: See, that’s one of the most interesting things I learned. The Asian SF writers and fans I met are generally quite knowledgeable about western SF — that is, English-language novels and short fiction produced by American and European authors, particularly that which has been produced over the last couple of decades. Most are unfamiliar with a lot of the classic works and authors, because those works have been invisible to them for so long. Because my keynote speech was about the origins and cultural role of American SF, and why this history is so important to understanding the genre’s purpose, it received a good reception, if I may say so myself. On the other hand, China’s SF writers are predominantly young, and they’re aware that they’re creating a SF culture of their own. They’re not out to mimic western SF or imitate what we’re doing, but to create their own literary world. 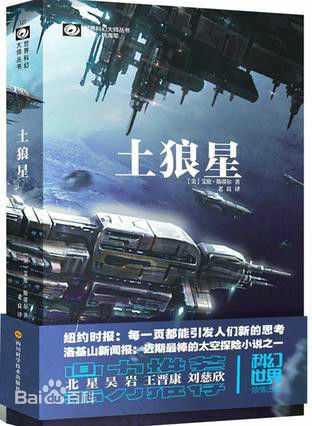 China is justly proud of Three-Body Problem, and Cixin Liu has become something of a national literary hero, so a new generation of SF writers have been inspired by this success. Yeah, they like American and British SF well enough, but they’re more interested in seeing what’s coming out from Bao Shu or Tang Fei than … well, just about everyone who has a story on the Nebula or Hugo ballot this year. That’s my impression, at least. YUNCHTIME: Is there a sense of China as the emerging space race super-power, as a driver for increased interest in SFF in PRC? To my surprise, I didn’t hear a lot about Chinese space efforts, although there were some science presentations that touched on space-related matters, such as MIT scientist Lisa Nip’s discussion of altering the human genome to produce humans adapted for living in space. That might have something to do with the fact that China’s space program is very much a government effort, and in Hong Kong there’s a certain reluctance to publicly discuss anything that might be critical of the government and the party that controls it. Another thing I learned while I was in China was the profound difference between that aspect of life in Hong Kong and life in Beijing, and if you understand Hong Kong’s historical relationship with mainland China, then you know the reasons why this is. YUNCHTIME: Your own fiction is often in Near-future settings. With China’s rapid development of the Shenzhou spacecraft, orbiter, and aerospace missions, do you feel as though the Chinese readership will be more intrigued by near-future SF? 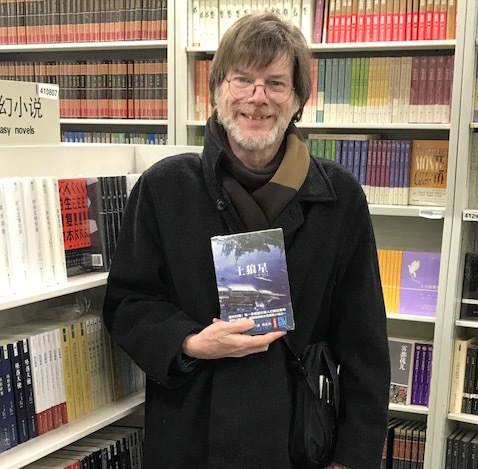 STEELE: I think the Chinese readers I met are interested in all kinds of SF, and thus aren’t as predisposed to drawing lines between sub-genres as western SF readers have become. It’s very refreshing to see this. And since they’re largely unfamiliar with my older work, like the Near-Space series, and more in tune with books like the Coyote series, which is set further out in time and space, I don’t think they’ve pigeon-holed me as the “blue collar guys in space” writer the way SF fans did when Orbital Decay was published almost 30 years ago. That was really refreshing, to be judged on the basis of my recent work and not the stuff I produced decades in the past. YUNCHTIME: Are you excited about these new bridges between the Chinese language readership and English language genre fans? STEELE: Yeah, you bet. Cixin Liu was just the first. We’re going to be seeing more writers coming out of China, provided that they can find good translators and publishers willing to take a chance on something from another side of the world. If we can get the latter, then Ken Liu isn’t going to have to worry about getting more work as a translator. In fact, I’d say that anyone who’s cognizant of science fiction and able to translate Mandarian or Cantonese to English and vice-versa has an opportunity to get in on the coming Asian SF boom. YUNCHTIME: Hong Kong itself is a city for time travel, connecting the colonial past with the ultra-urban future. What is your sense of HK as an sfnal space? STEELE: The easy SF analogy for Hong Kong is cyberpunk, with Bladerunner or William Gibson’s early Sprawl novels as being the touchstones everyone uses when they’re trying to describe the city. And there’s plenty to that, particularly the way the city looks at night, when you see all these enormous, futuristic high-rises lit up above streets that are unlike any in the west, even New York. All they need are air-taxis and Rutgar Hauer chasing Harrison Ford across the rooftops. But after I was there a couple of days, I began to get another SFnal vibe from Hong Kong, one that it took me a little while to nail down. It happened while standing in a long line with my wife and brother-in-law to take the cog-rail tram up Victoria Peak, the highest of the mountains on Hong Kong Island. I happened to notice all the kinds of people around me, all the different languages I was overhearing — here’s some Japanese tourists, here’s a cluster of young hipsters from Germany, here’s an Australian, here’s some Koreans, here’s Linda and me, a middle-aged couple from Massachusetts — and I was suddenly reminded of the 90’s TV series, Babylon 5. And that’s Hong Kong … a crossroads between the rival superpowers dependent on both but trying to maintain its cultural, if not always political, independence all the same. If you look at Hong Kong and Hongkongers in this way, then you get a better handle on it than the more superficial Bladerunner comparison. YUNCHTIME: After HK you went to Beijing? What was that like? How do you see China emerging as a setting, and a producer of science fiction tropes? STEELE: Beijing was an amazing city, too, but in ways that were both similar and different from Hong Kong. I’d never been there before either, and I was just as amazed and intrigued by it as I was in Hong Kong. And it’s part of the emergence of China as the next great consumer and producer of science fiction. Shortly before we left for China, I was invited by the Chinese cultural ministry to come back to Beijing for an international SF conference. 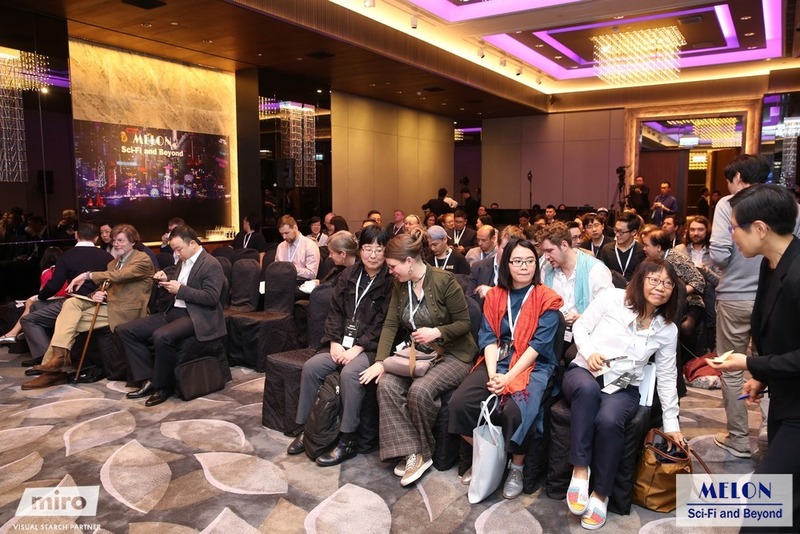 Unfortunately, this conference is being held near the end of May, less than a couple of months after returning from nearly two weeks in China. This trip took a lot out of me, and as I said before, I’ve been seriously ill lately and I’m still recovering. So I wrote back to the conference organizers and told them that I just wasn’t in shape for another trip around the world so soon, and asked that they keep me in mind for another SF conference in Beijing if one is held in the next year or so. 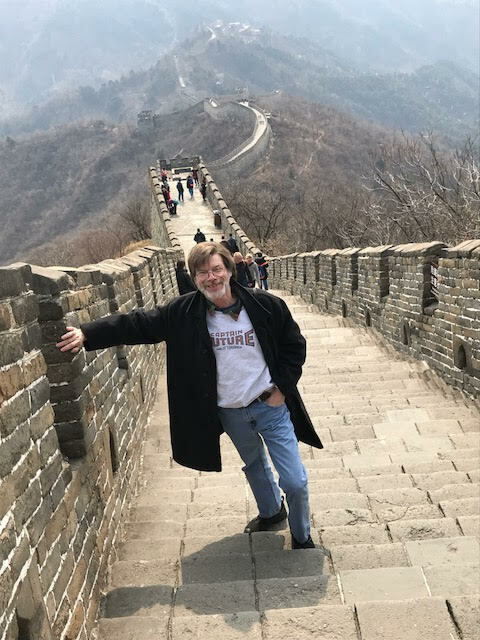 As far as Beijing being a setting for SF novels … well, I toured the Forbidden City and went out to the Great Wall and went shopping in the Night Market and bade my respects to Mao’s tomb. And at some point during my travels, I found the thematic core of the book I’ve been trying to write for the last year or so. So China has influenced at least one SF novel I know about … my next one. Thanks very much to Allen Steele for sharing his impressions of the Far East! Allen Steele is a prolific author of Science Fiction, whose latest novel, Arkwright, is available from Tor Books. Visit Allen’s website for more info! And for our Chinese language readers, check out Coyote in the Chinese edition: 土狼星 which translates as Coyote Star. See also our Interview with Christine Luk about the Gender in SFF Discussion held at University of Hong Kong on March 16th, 2018.